Women’s Library Club of Lovell officially incorporates. Charlotte Hobbs graduates from Wellesley College and returns to Lovell. 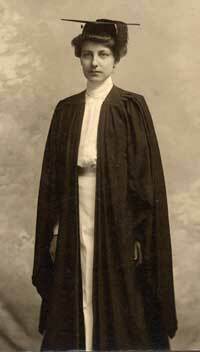 Born in 1879 in Lovell, Charlotte Hobbs dedicated herself to the people of her village. After graduating from Wellesley College in 1902, she returned to Lovell to teach school, tutor students, and collect historical materials, all the while committed to creating a library for the town. She was the driving force behind the drama productions that raised money to construct our library building. For more than 50 years, Charlotte Hobbs served as our librarian. 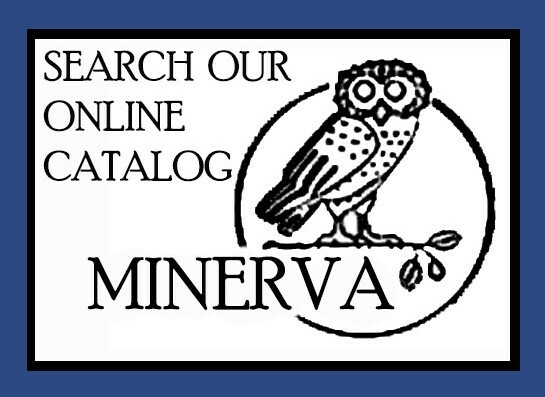 She was also the village historian and her papers are now in the Lovell Historical Society. After her death in 1969, the Women’s Library Club changed the library’s name to the Charlotte Hobbs Memorial Library as a lasting tribute to this remarkable woman. First of many fundraising dramas put on at The American House, the main hotel in town and the center of 19th century Lovell social life. 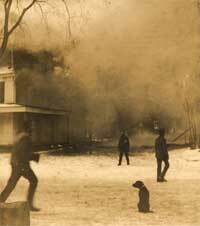 Fire destroys The American House; Library Club buys lot for $450. Drama ‘Old Maid’s Convention’ put on at the VFW. More dramas put on to raise money to construct our library building. Lovell Public Library opens its doors. Town of Lovell votes to raise $200 for library support for first time. Fiftieth anniversary: Charlotte Hobbs and ladies on front steps. 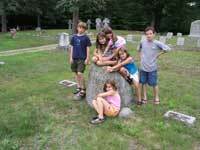 Participants of 2003 Digital Photography Workshop visit Hobbs Family grave. After Charlotte Hobbs’ death the Library Club changes the library’s name to The Charlotte Hobbs Memorial Library as a lasting tribute to this remarkable woman. Library Club President Mrs. Theo Dallinger and Gerry Andrews pose during renovation. Renovation and Addition paid for by Charlotte Hobbs’s legacy. Roger Blood selling nature mobiles at Arts & Artisans Fair, 1979. First Arts & Artisan Fair, will become biggest annual fundraiser since the drama series. All 250 local schoolchildren visit library once a week. Writer Stephen King attracts many fans at reading. Proceeds become seed money for the Building Fund. Campaign Brochure, designed by Roger Williams. Our village is proud of its library. Opened in 1908 it remains the center piece of community life. 2010 After an eight year campaign the library opened the doors to its expanded and renovated building.